With the warmer temperatures coming and the trails finally opening up for the spring riding season, everyone is ready to get the old faithful ATV out and clean it up before the first ride. Cleaning is a good start, but we should look a little deeper into the machine itself and see what it may need before you flip that key switch and bolt off down the trails. After all , it could be the difference between a great day of riding with your buddies and one you’ll want to forget! Following these suggestions will hopefully get your ATV or UTV back on the trail and running reliably for many rides this spring, summer, and fall. If you ignore them, we don’t want to hear you whining when it breaks down! 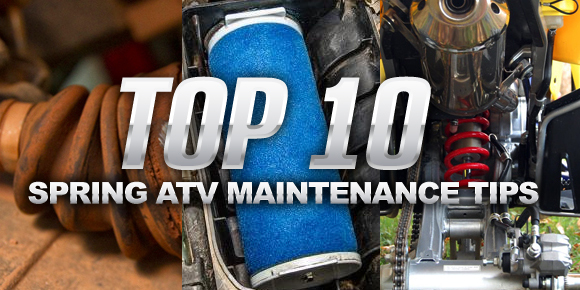 Read more about the Top 10 Spring ATV Maintenance Tips at ATV.com.